Grace to you and peace from God the Father and our Lord and Saviour Jesus Christ! 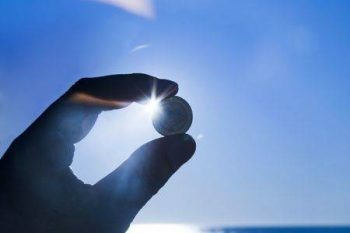 Have you heard about this illustration, – that if you take even a little coin and put it close enough to your eye, and then try to look at the Sun, the coin will actually look larger than the Sun. The little coin appears larger than the Sun… I wonder, how often we as Christians take this life with all that seems so important and put it that close to our eyes that not only it appears larger and more significant than the life to come, but we may not see anything else at all. The little coin – this life, the Sun – the life to come. The inevitable reality is that the life to come is to come. To each one of us. Today is a very fitting occasion to reflect on this. All Saints Day when we remember all the people who already have passed through this life into the next. Our readings for today are truly remarkable. John’s vision from the Book of Revelation. John’s words of encouragement from his first letter. And Jesus’ own words of blessings from the most famous speech in the world, the Sermon on the Mount. All of this to bring us joy and comfort. Today I would like to focus on the Sun, so to speak, meaning, on the life to come. I believe this is something we should be reflecting so much more and much more often. And perhaps some of you do it already. But where to begin? The life to come is not something that we know too much about. It is not something we can explore with our senses, or try to see whether we really like it or not. I guess that’s why so many tend to focus on this life instead, on the little coin, so to speak. This is why people say to pastors – can’t we talk more about this life, about something practical, about us, instead of spending so much time listening to what the Scriptures say. Sure, if we have the little coin too close to our eyes, we may find it much more appealing talking about the coin than about the Sun, that is, the life to come. And, I guess, to some extent we all can relate to that. There are times when the struggles of this life demand too much from us. There are times when we need God’s own wisdom to navigate through the challenges of this world. And there is plenty of it in the Bible, and it is given for us so that we can learn it and be guided by it. Or the words of Paul the apostle: “If in Christ we have hope in this life only [it is about the little coin], we are of all people most to be pitied.” (1Co 15:19) Okay, fine, but how can we focus on something that we can’t see? Our gracious God is the Lord of the history, of the past and the present and the future. He has been generous and has revealed us glimpses of what is to come to His faithful servants, and they have written it down so that we could read about it and be encouraged in our hopes. Yes, but some may complain saying that what is given to us is just too little to get the full picture of what is to come for God’s chosen people. What is there to reflect on, and what is there to be hopeful about? For some it is even worse. Because we haven’t read carefully enough what the Scriptures tell about our future, too many Christians have these boring caricatures about what is to come in their mind. We may be even afraid to leave this lovely world to go somewhere where everything is white and boring angels keep playing boring music and nothing interesting really happens. That would rather be a fitting description of the hell. Anyway, when we think about the New Heavens and New Earth, we may be concerned that what we will experience there may be disappointing. Yes, we have limited descriptions for what our new home will be like, but this is not because it will be boring or disappointing. The very opposite is true. The descriptions are limited, because with our limited experience and our limited imagination we simply can’t picture, we can’t imagine the beauty, the glory and the joy that our Father and our Saviour Jesus have prepared for us. There will be Adam, our forefather. There will be Noah, the man who built the ark. There will be Abraham who left everything trusting the Lord. There will be Moses, the humblest of all men. There will be Paul, the greatest of missionaries, and Peter, who asked to be crucified upside down. There will be Polycarp who refused to deny Jesus and was burned alive. There will our own Martin Luther and his courageous colleagues, and countless number of people whom we remember as God’s saints. There will be multitudes of those whom this world counts as nothing. There will be those who are the poor in spirit, who long for God’s grace, those who mourn for their sins and the sins of the world. Those who are meek, those who hunger and thirst for righteousness, who are merciful and pure in hearts, peacemakers and those who are persecuted for the sake of Christ, for the sake of His Word. They will be blessed to stand before the throne and before the Lamb. Some of those who did crucify Him. Some of those who spit on Jesus and ridiculed Him while He was hanging on the cross. There will be Pharisees and Sadducees, there will be tax collectors and Roman solders, there will be communists and national socialists. There will be people whom history knows only as evil doers. We will be surprise whom we will see there. There may also be people who have hurt us more than anyone else. Our enemies. How so? Because we won’t make it there by our goodness, but only thanks to God’s undeserved grace and mercy. Only by God’s undeserved grace. And we all will stand there together, clothed in white robes, with palm branches in our hands, crying out our praise to the most wonderful Being, our God. Our sins will be forgiven, they will be washed away together with anger and bitterness and shame. We will be reconciled with God and with one another. Pure, renewed, beautiful and perfect. Loved by God, loved by Jesus and welcomed in His presence. Serving before the throne of God. Or remember Peter, John and James when Jesus was transfigured, and, for a moment, they were sheltered with Jesus’ divine presence. What happened? What was their reaction? Something that we could call extreme selfishness. “Jesus, it is so good here… so good… let’s stay here!” What they experienced was so wonderful, so overwhelmingly beautiful that right away they were ready to abandon everything and everyone so that only they could remain in that heavenly bliss. This is what we are looking forward. One more illustration. That may be so exciting a thought to be able to see all God’s people from the beginning of the time till the end. To enjoy their presence, freed from the sin, with all our senses purified, with our hearts cleansed from anger, and envy, and jealously and every dark spot. This is where we need the help of the Holy Spirit. Let’s pray that He helps us to understand this, at least a little bit. “We are God’s children now…” God has adopted you in His family. That’s done. This is who you are. But when Jesus appears in His divine glory, “we shall be like Him… you shall be like Him… and we shall see Him as He is.” You will see Jesus, true God and true man as He is. How about that reflecting on our future hope?! The glory of the life that is to come can’t be even compared with the sufferings and struggles of this time. And even today, our gracious Savior and our Brother Jesus comes to us to prepare for this wonderful future. Even today in the midst of His congregation He comes to wash our hearts clean with His body and blood and to fill us with His Spirit. The Holy Banquet where all God’s saints will feast together forever has begun. And what a gift it is! Another pastor shared this wonderful testimony. A member of his congregation who was a husband and a father died on Saturday. How surprised was the pastor when the next morning he saw the wife and children of this man kneeling at the Communion rail! Seeing surprise in his eyes the wife said: “I just wanted to be together with my husband and children with their father.” And here we all are, to be together with our loved ones who have gone before us and with the countless multitude of God’s saint. And even if the little coin tends to get too close to our eyes, may the Holy Spirit help us to see the Sun, rejoice in its brightness, and to tell about it to everyone who lives in the shadow of the little coin. Blessed All Saints Day! Amen.